The past year has seen magnificent gains for our county party. We just celebrated our wonderful volunteers with our annual Volunteer Appreciation Night, and it was a smashing success. We have a lot to celebrate. 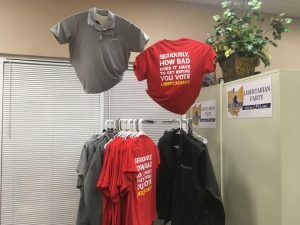 2018 saw the Libertarian Party of Ohio return to the ballot after nearly 6 years. 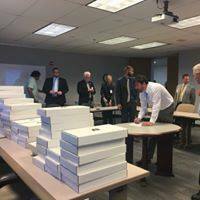 We ran multiple state-wide candidates, supported local candidates across the state and proved the value of our outreach platform. We’ve sent out thousands of emails, this monthly newsletter and in-between updates, kept our website up-to-date, hosted guest speakers on important topics and delivered candidate yard signs across this county and next! Many thanks to Ron Hood, Kirsten Pomales and Jim Fedako for their gracious time educating us on topics about right to work, school choice and education funding in Ohio. 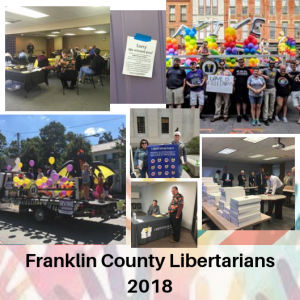 We planned, organized and executed a successful Libertarian County Convention with guest speaker Michelle Darnell, conducted county and state party elections, participated in the Stonewall Pride Parade and Festival (our Pride balloons were a big hit! ), walked in the DooDah Parade (with an awesome truck! 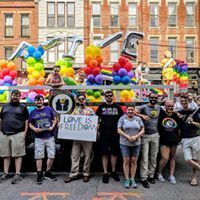 ), walked with another great parade float in Canal Winchester, promoted our cause and candidates at the Franklin County Fair, gun shows and helped out with other county and street fairs. We raised money to pay for these events, bought t-shirts for consistent volunteer appearance, and acquired a smart looking table cloth! It might seem mundane, but these events, t-shirts, table cloth, this monthly newsletter, the Executive Meetings and monthly socials are all critical elements to building beyond politics and policy. We are building community. We are serious about working to make things better and put things right. As we step forward again, with a new year ahead of us, we invite you to join us for a social, post a comment on Facebook, or submit your own commentary for this newsletter. We can’t do this alone, no matter how well intentioned. We need boots on the ground, voices on the phone and hands to wave signs. Contact us by form, contact us on Facebook or call our volunteer phone number, (614) 412-2026. Don’t be surprised if you hear from us first!